The former minister had the biggest job interview of his life this week, as he bids to become Agriculture Commissioner. But the issue of Irish Water just won’t go away, it seems. FORMER ENVIRONMENT MINISTER Phil Hogan is coming under fresh pressure this weekend, just days before he’s due to find out whether he’s landed the coveted Agriculture portfolio in the new European Commission. RTÉ’s This Week programme broke a story this lunchtime contending that Hogan knew that tens of millions of Euro were to be spent on external services during the set-up of Irish Water, months before he told reporters he wasn’t aware of the precise break-down. Irish Water CEO John Tierney said in a radio interview back in January that the new State company had had a €50 million spend on ‘consultancy fees’. The actual figure turned out to be even higher, as Irish Water executives later told an Oireachtas Committee. The revelations were a huge controversy at the time, as you may well recall. However, speaking to reporters on 15 January, Hogan said he wasn’t aware of the specifics of the spend on external services, noting that he “certainly knew” about the total €180 million cost of setting up the company. Asked directly if he knew how much was spent on consultants, he said ‘no’, going on to state that he didn’t micromanage Irish Water. According to journalist John Burke’s report for the RTÉ programme today, Hogan signed-off on an internal Department document, detailing the break-down of what was to be spent on services like IT, customer billing, and economic advice, three months before the controversy flared up. The document was signed by the Minister on 22 October last. (As Burke notes in his report, the word ‘consultancy’ didn’t appear on the document — but, as Irish Water executives said back in January, it had always been understood between the body and the Government that outside consultants would be required to establish the new utility company). The internal document included provision for €32 million spending on IT, €12 million on Customer Billing and Registration, €13 million on economic advice and €8 million on support services. “You can’t make an omelette without breaking eggs,” Hogan said in the 15 January doorstep interview, when asked if the controversy was a PR disaster. A statement from a Government spokesperson read on This Week effectively echoed the sentiment, if not the language, expressed by Hogan, saying that “initial costs in establishing a utility are inevitable and necessary”. Fianna Fáil leader Micheál Martin said Phil Hogan had effectively been “caught out” by Burke’s report, and called for the former Minister to make a “comprehensive statement” on the issue. We now know from this document which was signed three months before the controversy broke up, that he had seen and approved of the establishment costs, including the consultancy costs of Irish Water. Incoming European Commission President Jean Claude Juncker has been meeting with all 27 commissioners designate in the past week, and is due to make an announcement on who gets which job next Tuesday. 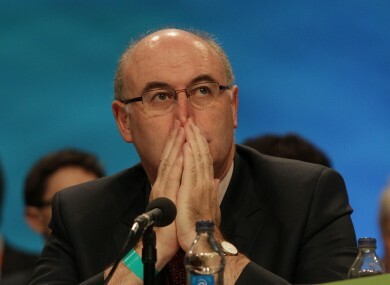 Ireland has been lobbying for the Agriculture portfolio, and Hogan is still considered a strong contender for the role. Email “It's the last thing he needs, but Phil Hogan's just been landed with ANOTHER Irish Water scandal”. Feedback on “It's the last thing he needs, but Phil Hogan's just been landed with ANOTHER Irish Water scandal”.